Scroll down to go right to the recipes and skip all the instructions! All will give your body an infusion of micro-nutrients that are highly absorbable! Check with your doctor if you have any special conditions or are prescribed any medications. Certain foods, like Kale, can decrease the effectiveness of medications. See the Diets and Recipe Page for a color coded chart of fruits and vegetables to include in your Juice Fast. Be Prepared! Never start a juice or blended drink fast without having everything you need ready to go! -When you do a "juice" fast, you eliminate everything from your diet except fresh, whole produce in a concentrated, and juice form. -REMEMBER, this means no dairy too. -I don't recommend any one supplement product, however,a multi vitamin and the one extra vitamin I do recommend taking is vitamin B12 since you may not get enough unless you eat animal products. You only need to do this if you are not eating, eggs, dairy, or meat for extended periods of time. -My most successful clients usually do their juice fasts for approximately 3-7-20 days. Which one; Juice (Juicer) or Blended Drink (aka Smoothie)? If you can only choose one drink, then choose the blended drink. The blended drink will give you all the fiber and the nutrients that help digest all those vitamins you get through fresh, whole produce. -For overall health and digestion, and for changing your diet, I believe this is the best option. However, in some cases, juicing may be a better option. Why the juice extractor kind? -Juicing (the juice extractor kind) is good because it allows you to get a concentrated amount of nutrients by using the large amounts necessary to produce juice. You should treat juicing like using supplements. This could replace your main vitamin supplement. -It is easily absorbed into the system and your vitamins and nutrients will not go right through you the way they do with supplements. -Doing both juicing and blended drinks will give you everything you need during your juice fast. -If you do both, you are getting a variety, and a powerhouse of nutrients and fiber. -Have mostly blended drinks with about 2 or 3 juice extractor juices (about 8 oz each juice extracted type). -Your total drinks combined may be as much as 6 to 10 per day depending on your hunger level, and the size of the drink (most blended drinks will be about 12oz). Can I eat during a Juice Fast? No, not for a "pure" fast. If you want to completely reset your eating habits then it is best to stick with the pure, juice fast at least 3 days or longer. However, some people find this very difficult and may want to try having a handful of nuts, or whole pieces of raw veggies if they get very hungry. One of my personal favorites is the "egg, and juice plan"! This is adding in a few boiled eggs during your fast to give you protein and help stave off the hunger. Or, if you feel you are not ready to completely fast, try replacing your dinner with a blended drink instead. -If possible, you should try to get as many vegetables in your drink as possible. However, it can be very hard to choke down some of the 80% vegetable, and 20% fruit drinks that are often recommended for traditional juice cleanses. -Choose lower sugar fruits like blueberries, and blackberries. Adding a nice, whole, peeled tangerine is certainly not going to upset the "diet apple cart"! -You can play with any of the recipes below to see how low you can go on the fruits, but still keep it at a tolerable taste level! -For blended drinks, add water to cut down on the thickness or pulpy texture. -Keep it colorful! I try to get at least 3 different colors. -Since you only get a small amount of protein through most fruits and vegetables, you may have to sacrifice some protein. However, most people now days get far too much protein. -Animal protein tends to add more bulk so if you ARE trying to bulk-up and WANT weight gain, animal protein will certainly make that easier. -Plant based proteins build a leaner body. See my article on the side bar titled, "Energy Yielding" to learn about the energy yielding nutrients, or the substrates. If you still want to learn more about protein, juicing and a plant based diet, scroll down below the recipes for plant based proteins, or refer to my diets and recipes section. 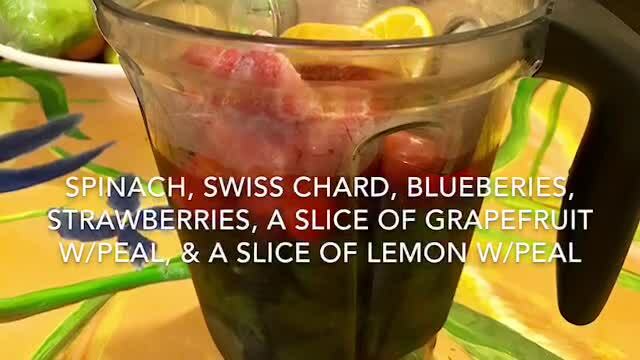 Find my "Sport Drink" recipe below the blended drinks and juice recipes. Try adding a lemon wedge with skin and all, and a mint leaf to your blended drink. It will give it a refreshing taste! Also, you will notice I have sprinkled "organic" among many of the recipes. Getting organic most of the time is recommended especially for berries, and things that don't have a thick peel. Add water, enough to cover the above mixture to blend easily. Blend well until all ingredients are smooth. 1.5 cups of frozen strawberries, or blueberries, or peaches, etc. Bob likes sweet stuff so he wanted the orange juice splash and Stevia. A lot of crushed ice! Parsley Powerhouse (For Vitamix) Why Parsley? It is a powerhouse of nutrients and another one of those "healing foods". Add it to any drink to "power" it up! Note: to make this drink more of a "Bloody Mary" tomato juice, add lime juice. Below I recommend a whole orange for this smoothie, but if you can't find a good sweet orange yet, then find a fresh or frozen WHOLE fruit (no sugar added) that will have a nice sweet taste. You will need the sweetness to counter the tart/bitter flavor of the cranberries. Blend to taste. If it is still not sweet enough to suit your taste, you can add a little bit of Stevia sweetner. Add just a small amount until the drink tastes good enough to you. From the documentary, "Fast, Sick and Nearly Dead"
Carrots are loaded with beta carotene and many of the nutrients inside the carrot can only be unlocked if either cooked (which kills the enzymes), juiced, or fully blended with a Vitamix then mixed with water. You need to add water to the carrots when using a Vitamix since the fiber is retained. The water will help to thin the pulp. For juicing with a juice extractor, there is no need to add water. The fiber and the juice will be separated allowing you to get only the juice. You need to use a lot of carrots to get a full glass of juice. Some people like straight carrot juice, but most find it better with apples or oranges added. The carrot/apple blend is often used as a therapeutic home remedy by many "juicers". unscrew top and throw away then juice the rest! add ice for a refreshing cocktail! Make your own sport drink to insure you don't get all the chemicals that are in most packaged sport drinks. You only need to use an electrolyte beverage if you will be sweating profusely for more than an hour or on hot days where you will be exercising outside. *Green or red apples, which is better? Although a green apple tastes more tart, it actually has just a tiny bit less sugar than the red. The red is slightly higher, but not enough to make much of a difference for you. The reason an apple turns red is because when the sugar level becomes slightly higher, it forms the red pigment known as Anthocyanin. This Anthocyanin is like a natural sunscreen for the apple (or any fruit or vegetable that turns red or purple). To cover all your bases, try one red and one green. AKA...anthocyanin or chlorophyll! The main objective of a juice/blended drink diet is to change your eating habits while also getting a lot of nutrients. The component that is often missing from these juice/smoothie cleanses is protein. Depending on your overall goals for weight loss, I usually only recommend no more than a 3 day blended drink (juice) fast then go to doing drinks with plant based proteins for a period of days. This can be done either by supplementing a couple of meals a day with your smoothie then having one plant based meal. Or you can have drinks with things like edamame, quinoa, flax seed or nuts (if you are not as concerned about getting all plant based, then try eating boiled eggs). For example, maybe you decide to keep getting all the great nutrients that pure plant based drinks offer, but also add pumpkin seeds to your drink! These seeds are loaded with protein and by mixing them with your green drink, you will have a complete protein. How do you do this? You can grind up the seeds in a grinder then add them to your drink or simply eat them along with your drink. If you have a Vitamix blender there is no need to grind the seeds first because your powerhouse blender will do this all at once! You can find pumpkin seeds under the name of "Pepitas" at Trader Joes. I recommend you buy unsalted, raw seeds for when you grind your nuts and add to your drink. Buy the salted roasted version if you want something a little more enjoyable to eat along with your drink! Dieting in Carmichael, CA, Fair Oaks, CA Sacramento, CA Citrus Heights, CA, Orangevale, CA, give us a call for an in-home plan!